Most of the day was spent working on the flesh tones and molding those big pudgy cheeks and eyes. Did I mention how much I love painting kids & animals, you just can't help but smile while you work. 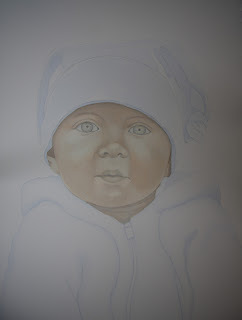 The color of her eyes will be left for a bit until more of the skin tones have been built up. Now to put a rosy glow in those cheeks!